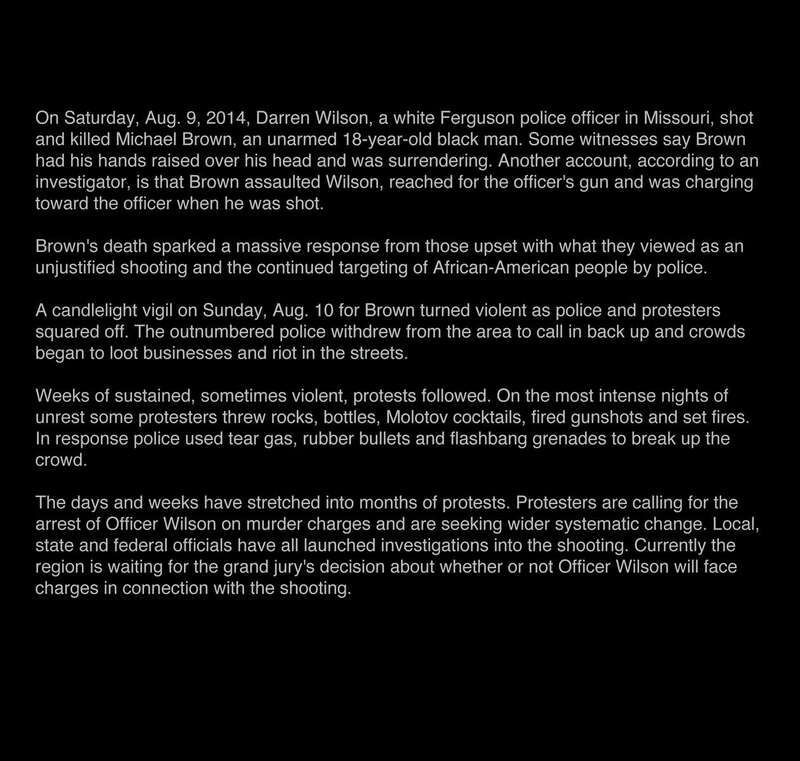 On Saturday, Aug. 9, 2014, Darren Wilson, a white Ferguson police officer in Missouri, shot and killed Michael Brown, an unarmed 18-year-old black man. Some witnesses say Brown had his hands raised over his head and was surrendering. Another account, according to an investigator, is that Brown assaulted Wilson, reached for the officer's gun and was charging toward the officer when he was shot. Brown's death sparked a massive response from those upset with what they viewed as an unjustified shooting and the continued targeting of African-American people by police. A candlelight vigil on Sunday, Aug. 10 for Brown turned violent as police and protesters squared off. The outnumbered police withdrew from the area to call in back up and crowds began to loot businesses and riot in the streets. Weeks of sustained, sometimes violent, protests followed. On the most intense nights of unrest some protesters threw rocks, bottles, Molotov cocktails, fired gunshots and set fires. In response police used tear gas, rubber bullets and flashbang grenades to break up the crowd. The days and weeks have stretched into months of protests. Protesters are calling for the arrest of Officer Wilson on murder charges and are seeking wider systematic change. Local, state and federal officials have all launched investigations into the shooting. Currently the region is waiting for the grand jury's decision about whether or not Officer Wilson will face charges in connection with the shooting.